No. I hadn't forgotten her. I've been distracted by comics, kittens and Necrons, but I hadn't forgotten her. It was actually good to step back from it for a while and look on it with a "fresh set of eyeballs" as one of my favorite painting instructors in college used to say. 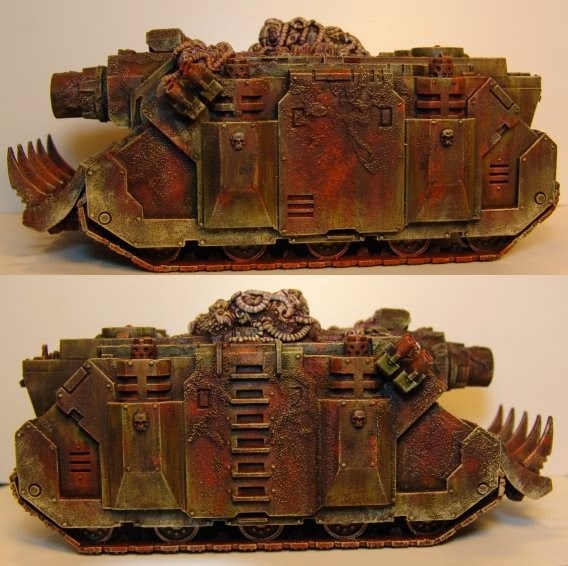 I did some drybrush weathering with a sand color and several washes to the main hull. Telling you what the process was is a bit hard. I was just "in THE ZONE" and it all came together. I did use some GW Typhus Corrosion. I watered it down and used it as a wash in areas. Also streaked some of it in places. Then my good old Althonian Camoshade as well to dull down some of the highlights from the sand colored drybrush. Very pleased with the result. For the most part, save a bit more weathering, the hull is done. 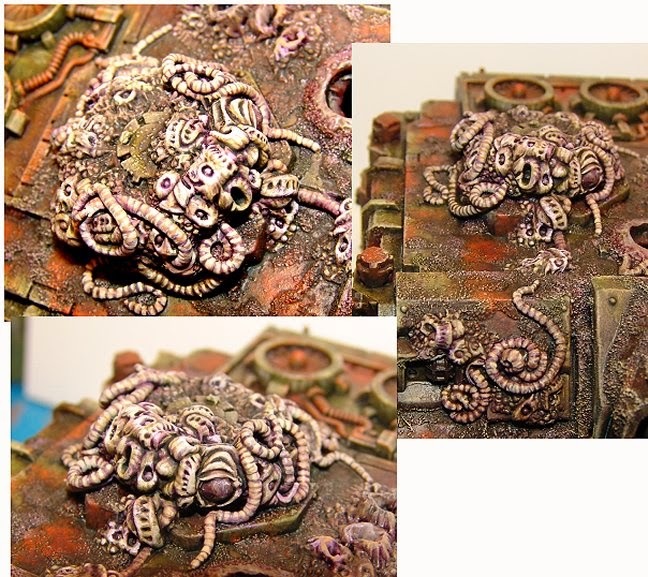 The organic/gribbly corruption is still ongoing, but I have finished the corrupted hatch, for the most part - save some pustules and a couple eyeballs. There's still more corruption to finish. There will be some glossy detailing and such to the organic parts, but you can tell the basic color pallet from what is here. Well.... I'll probably try to be a bit gross and make a few spots look infected and such. Because....well, Nurgle. I have some of the Berserker hoard in the Krud Kutter bath and will start the laborious process of getting them stripped and rebuilt soon. I can see the Khorne Deamonkin book in my near future. :) But, as usual, I'm planning to do something a bit different from the traditional "look its red, it must be Khorne" paint scheme. Hobby time has been a bit more than limited of late. In part, due to these two! If you've been following for a while, you know the wife and I are involved in kitty rescue work, specifically newborns and bottle babies. Well, the wife is out of town and I have these two miscreants to deal with. 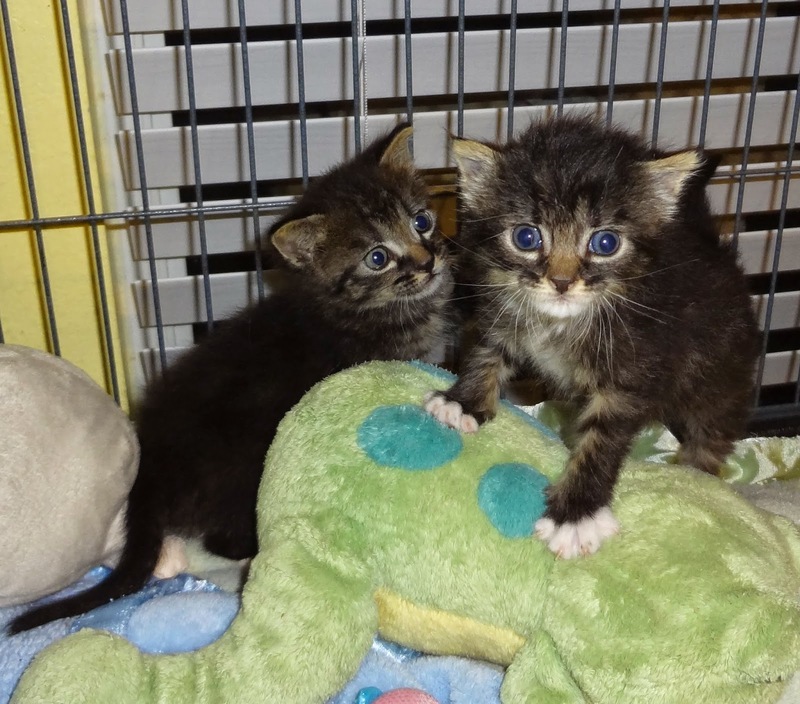 One was found stuck in a wall by a firefighter and the other in a planter. Plus, the only bathroom I had that was animal free now has a pregnant cat in it. If you have animals, you know how nice it can be to have some solitary "reading" time.... but no, not anymore. And within days, I'll have a litter of kittens in there with her. Welcome to Spring in Central Florida. Please Spay and Neuter. BUT... enough of cat world. I've been working fevorishly on artwork for my comics as well as occasionally making it to my hobby desk. While this is thoroughly unexciting or even inspiring, I have put the base colors on 20+ Necron Warrriors and one grumpy, drooling Ork Mad Dok. 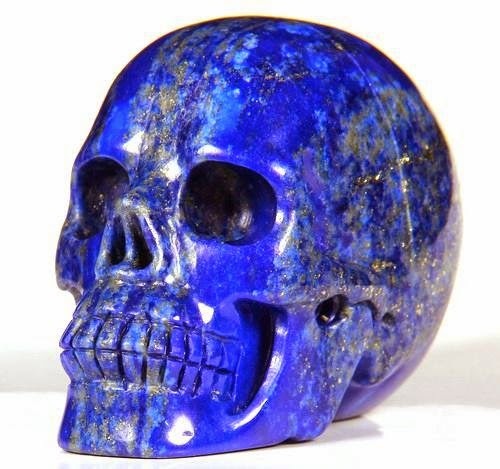 After some serious research on just how friggin' cool Lapis Lazuli can look. The 0001001 boys are base colored in GW Necron Abyss and my own black brown (GW Scorched Brown + Chaos Black @ 50/50) The blue parts will be Lapis, the brown will be Bronze, dirty bronze. 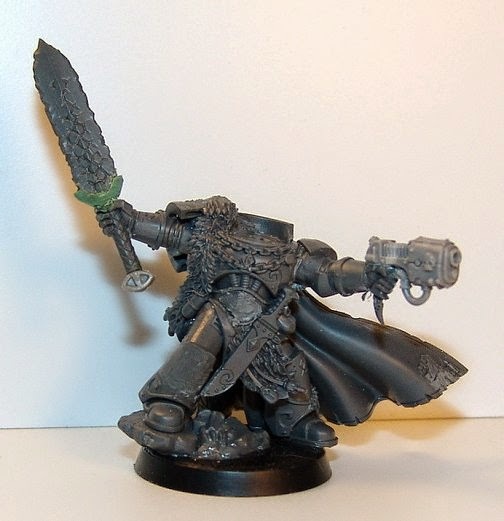 I also puttered around with the slow conversion (aren't all of my conversions slow.... I mean, I work way too damned slow. If only they'd just let me work on hobby stuff. 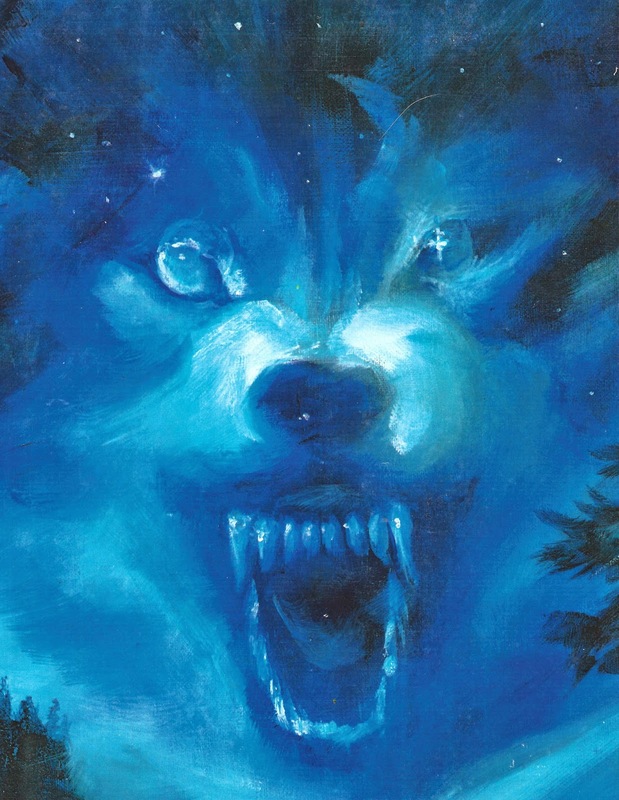 ;) ) of the first of the DOOOoom Wolves. 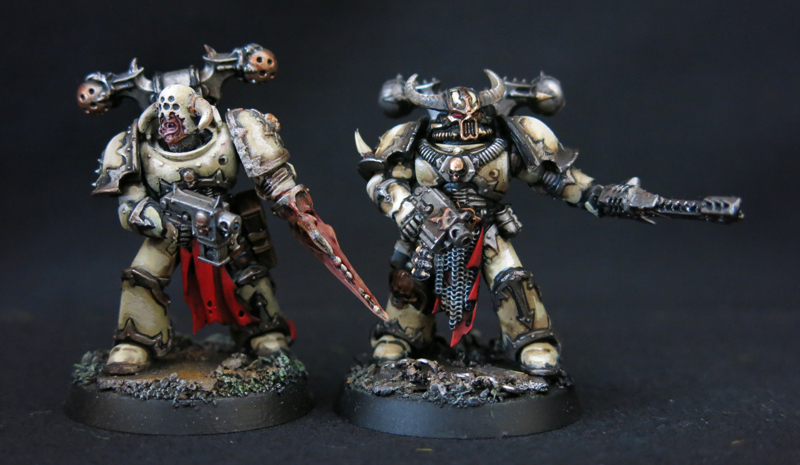 These guys are intended as "Space Wolf" allies for my Nurgly Guard er...Adeptus Militarius...um- that used to be the Imperial Guard- army, since I can no longer ally my normal Chaos army with it. Which is BS, by the way... but ya know. I had a guy a couple weeks ago say "Why don't you just get IA 13 (or which ever) with the traitor rules?" I replied "If you can convince my wife I need a $100+ book for a game I barely play, when I already have rules I can use that the army was built for, knock yourself out." Models are great (and the best part of the game as far as I'm concerned).... but frankly, you can play the game with a bunch of nickles or cut out paper counters if you really want to. If I want my AM/Guardsmen to be Nurgley its perfectly fine. But, I digress..... here's the start of my Chaosy Space Wolves. Think burning from the inside out with a bad temper, because frankly that can't be comfortable Vikings in power armor. That'll be the look/paintscheme I'm going for. Still a lot of sculpting to go on this guy. Phalo-cyanine Blue has always been one of my favorite acrylic paint colors. Its a beautiful blue. With a little white, its a hauntingly beautiful blue. Its so beautiful, when given a mono-chromatic painting project in college (22 years ago) I HAD to use it. That's not the whole image, but you get the idea of how "PURTY" Phalo-Blue can be. Well, remember GW Necron Abyss ..... is Phalo-cyanine Blue. 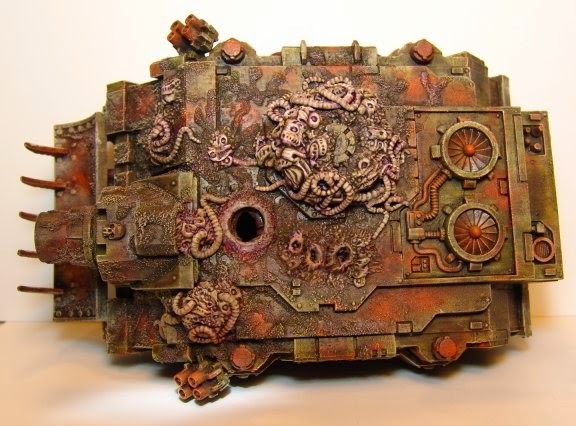 If its Necron Abyss.... how come there's no Necrons painted that way? Hrrrmmmmmmm, I said to myself.... that needs to be fixed. 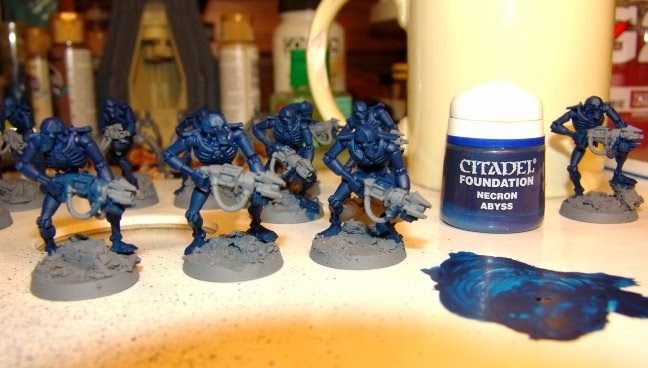 And, I've always wanted to paint an army blue that wasn't "traditionally" blue. Now, thinking of the Necrons and their background... I'm thinking Lapis Lazuli. Regrettablly, I haven't had a ton of hobby time, so the lads are looking a little monotone at the moment, with only a basecoat over their primer. But, its a start. BUT... I called in someone to help, who is eager to get painted himself. BLAM!!!!!! Make way, ya git! I'll fix dem boyz up jus' fine! I promise that is the last time I'll quote Britney Spears. No new pictures of models, yet. Necrons are primed. I should get some hobbytime in Saturday night and Sunday, so look for a post around then. In the meantime, if you want to see some more non-Warhammer doodles that leaked out of my brain, check out my ART BLOG. 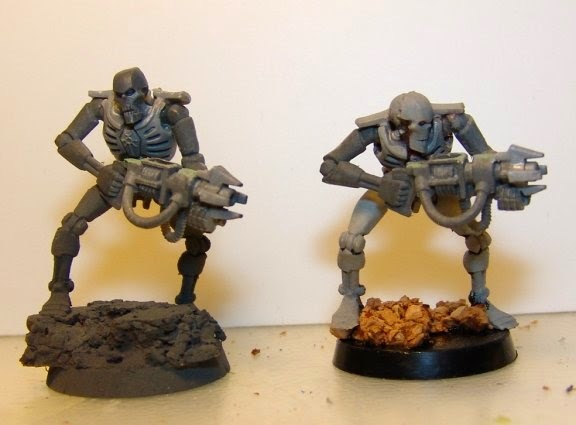 The Necron assembly line continues. I haven't had a ton of hobby time, but should have something to show for it in a couple days. However, I did post some stuff on my ART BLOG for those that might be curious. Keep an eye out here in the next couple days for a hobby update. From the Workbench: Tin Men! I've come to a couple conclusions in my absence. One, doctors think a trip to the hospital is always a good idea, never considering how much it costs. Two, I'm fairly certain that several days of fever, deprivation and or hallucinogens were involved in the origin of all major religions, not to mention things like the spork and Ronco's Mister Microphone. (For those too young for that reference, check THIS out!) It also might be responsible for me dusting off my Necrons. Initially, I bought the first box of Warriors for parts. 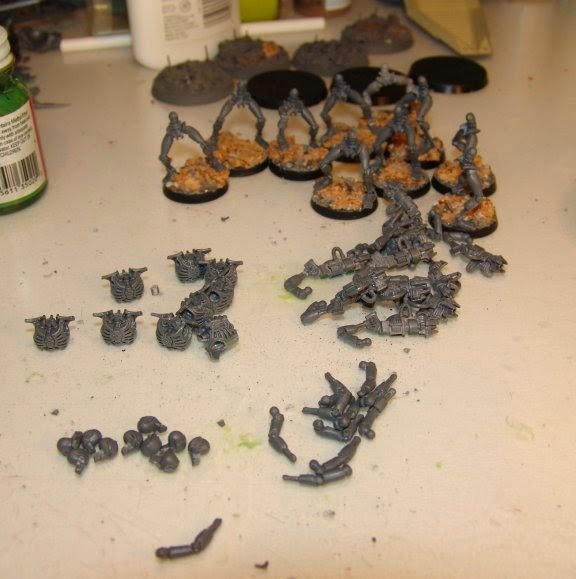 I was going to use some of the parts for conversions and the rest for bases for my Orks. Then the Allied charts came out and I found out that I could ally Necrons and Orks and that idea was just too cool.... and too damned funny to pass up. I've never been a big fan of the green rods and I want to go with a sickly white-green for the glowing undead feel, so I made carbines. Besides, who the f*** puts an axe on the end of a gun?!?! Its a quick and easy conversion. On the left are the cut down parts, on the right the parts before trimming.. When I chop off the grip, I cut the thumb off and glue it on to the hand. I carve out a little "trench" in the hand area where the front "zappy" piece will go. OH... and do futuristic robots need a big sight on the top of the gun? I go the assembly line up and running and here are the first 10. And my favorite 5... so far. Between the two boxes I had, I can get about 21 complete guys. The left over guys, I'm going to have to make some "Uh... the reanimation thing didn't work so well" - "Hey, where'd my head go? "- guys. That should be some fun. The other part of the plan, since I have an absolute TON of unbuilt Orks. SO..... 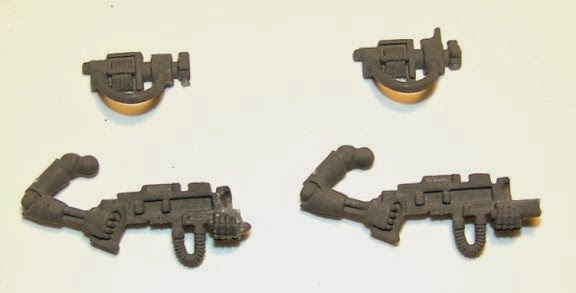 I'm going to mix the Orks with some Necron technology. 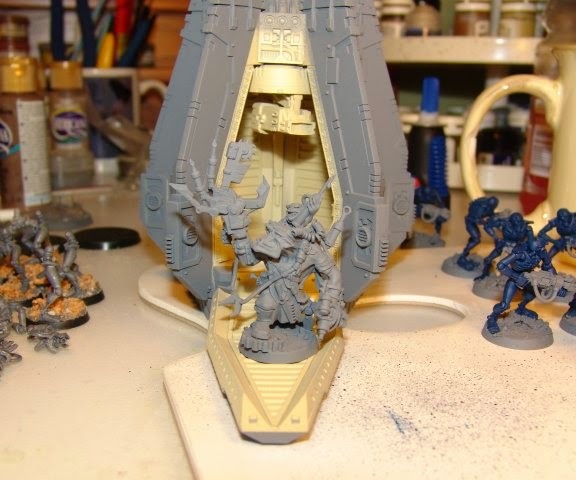 I'm still working up the back story, whether the Orks are "slaves" or the Crypteks and the Meks did some sort of deal. But Hijinks will ensue. This will give me something to have fun with along with the Chaos army. Good stuff ahead and comics as well. Its going to be a fun spring.